Forums containing Fishing Reports, Fishing News, General Fishing Discussion, Boating and Four Wheel Drives (4WD's). There are (30) full-feature Fishing Reports with photos. There are currently (13) fishing photo albums by country showing different fish species available around the world. Lot's more photos in other galleries on this site. We welcome your submissions! Submit your fishing photos, fishing articles or fishing reports here. Project Fishing Boats - A labour of love or a love of labour? Links to other fishing related websites. FishView shows the TOP 50 fishing photos that have been viewed on this site since FishCount was first introduced. Where does your photo rank? Featured Fishing Photo: SportfishWorld's Bob Fisher and fishing buddy Rich Pharo went on a charter trip aboard Capt. Rick Power's New Sea Angler out of Bodega Bay in Northern California (February 2006). This is one of many Giant Humboldt Squid in the 30-40lbs plus range that were caught jigging at the Cordell Banks that day. Photograph by Rich Pharo. 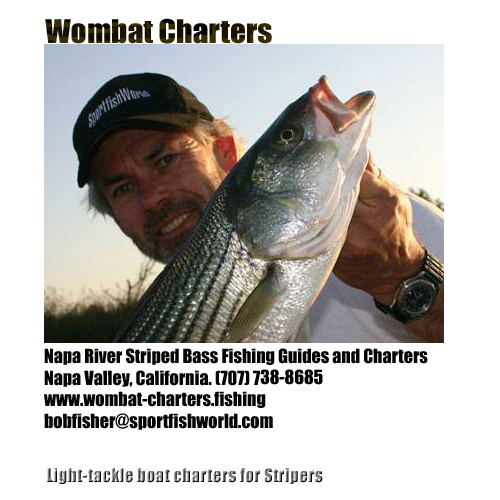 Striper fishing the Napa River in Napa California. Licensed Fishing Guide and Fishing Charter Captain. We also offer Scenic Boat Cruises, Wetlands Tours by Boat, Romantic Sunset Cruises on the Napa River or Carquinez Strait with Capt. Aussie Bob, USCG 6-Pack license. Two boats, twice the possibilities! The Giant Humboldt Squid fishing photo gallery. Photos of jigging for and catching Giant Humboldt Squid aboard a charter boat. This link takes you to our Feature Fishing Report on jigging for Giant Humboldt Squid at the Cordell Banks where Rich Pharo and I were fishing aboard the New Sea Angler with Captain Rick Powers out of Bodega Bay in Northern California. The Great White Shark photo gallery. Carcharodon carcharias...The Great White Shark. Click on the link above to view my report about an experience with Great Whites in a small boat just offshore from the Albany Whaling Station in Western Australia during the 1970's.